This article provides a list of various welfare schemes launched under Mr. Narendra Modi's regime during 2014-17. This article will be of immense help for the students who are appearing for various competitive exams where General knowledge questions on this topic may be asked and also useful for the citizens of India to know the various welfare schemes launched by Government of India. Narendra Modi Government in the wake of assuming power in May 2014 has initiated numerous welfare plans including the well known Jan Dhan Yojana, PM Awas Yojana, Suraksha Bima Yojana, Smart City Mission among some more. Here I am providing the details of plans propelled by Mr. Narendra Modi Government till September 2017. The plans initiated by Mr. Narendra Modi government in 2014, 2015, 2016 and till September 2017 additionally incorporates plans of previous governments which have either been renamed or revised or both. I gave a brief account of these schemes which will be useful for the candidates who are preparing for various competitive exams as well as for the common citizens of India. Launched on 25th July 2015 in Patna. Subsidy given to the scheme to the extent of 43,033 crores. BPL will get a free power connection with LED lights at Rs.3000 per connection. GARV-2 application initiated to give real time information to about six lakh towns of the nation. Achieving 100% electrification to rural regions. Launched on first of May 2016 in Uttar Pradesh. Aim:- Improve social welfare by providing LPG connections to BPL family units in the nation. To avoid the use of unclean cooking fuels with the perfect and more productive Liquefied Petroleum Gas (LPG). Budgetary help of Rs. 1600 for each LPG connection. Executed by the Ministry of Petroleum and Natural Gas. Launched on 24th October, 2016 in Varanasi. Aim:- A 2540 km long gas pipeline which will ensure supply of clean and eco cordial fuel to no less than seven principle urban areas – Varanasi, Patna, Jamshedpur, Kolkata, Ranchi, Bhubaneswar and Cuttack . To provide availability of approximately 5 lakh LPG gas Cylinders within next 5 years. 20,000 vehicles will get the facility of CNG filling. To sustain rural India till they come out of poverty. To improve jobs in little business undertakings, agricultural based rural India and work provision in formal segments. Provide scope for expansion and advancement in business entrepreneurship. Launched on ninth June 2016. Aim:- To enhance the quality and scope of Antenatal Care with Diagnostics and Counseling administrations as a component of Reproductive Maternal Neonatal Child and Adolescent Health. Offers some extra chances to every single pregnant lady who have missed their risk natal visits because of unseen reasons. To provide care provision arrangement by a Doctor, Physician or Specialist in the second or third trimester. Pradhan Mantri Surakshit Matritva Abhiyan will be held on the ninth of every month consistently. Launched on first December 2016 by Human Resource Development Minister Prakash Javadekar in New Delhi. Aim:- To go for cashless payments and transaction modes like utilizing credit or debit cards or the money wallets to decrease the economic malpractices in the nation. To stop the malpractices of corruption and to end black money in India. To encourage the average folks to go for cashless transactions to bring an upsurge to Indian economy. Launched on 25th December 2016 by Union Health Ministry as a team with the Ministry of Drinking Water and Sanitation and Human Resource Development Ministry. Aim:- To reinforce the Health Centers and to develop open defecation free blocks. Allowance of Rs 10 lakh to every Community Health Centers (CHCs) in ODF squares of the nation. Group Health Centers (CHCs) in ODF blocks bolstered to accomplish Kayakalp confirmation. Gram Panchayat of Kayakalp Primary Health Centers (PHCs) organized to end up ODF. Training in WASH (Water, Sanitation and Hygiene ) of CHC/PHC chosen nominees. Launched on 15 th December 2016 by Prime Minister Narendra Modi. Proposed by NITI Ayog headed by Arvind Panagariya. Aim:- To expand the "Cashless Transactions"
NITI Ayog stands for the "National Institution for Transforming India". Prizes for Merchants for every computerized exchange worth Rs. 50,000, Rs 5,000 and Rs. 2,500. Motivations might be given to transactions inside the scope of Rs 50 and Rs 3000 (average citizens). The winners will be chosen through a random draw of the qualified Transaction IDs. Launched on fifteenth December 2016 by NITI Aayog and NPCI. Aim:- To provide motivation for "Cashless Transactions"
In this Yojana, there will be a fortunate winner for the customers who will accomplish more cashless transactions amid a specific period. This plan is for dealers and clients as it were. The individuals who are doing cashless transactions by utilizing AEPS, USSD, UPI, RuPay. They will be qualified for this plan. Launched on first December, 2016 in Vijayawada. Offers medical coverage up to 2 lakh and free treatment. Gives therapeutic treatment to 1044 diseases. The new Married couple either the spouse or husband has a place with other state can be enlisted under one family by paying the whole yearly premium. Individuals would register for this plan at any of the Mee Seva Centers in prescribed time every year. Launched on 1 July 2015. Aim:- To give a protected stock piling of records in advanced form. Advanced record contains the URL'S of the archives issued by the administration organizations or some other elements. Transferred archives contain every one of the reports transferred by the user,each not surpassing 10 mb of space. Launched on 25th December 2016 on 92nd birth commemoration of Atal Bihari Vajpayee. Aim:- To give medical coverage against 437 ailments including 5 basic illnesses. The plan will take off from 1 April, 2017. 437 ailments are separated into six groups which are kidney, cardiovascular, tumor, burns, neo-natal and neurological conditions. Make our nation well developed. Launched on 25th December, 2016, on the birthday of previous Prime Minister Atal Bihari Vajpayee. Launched by Chief Minister of Madhya Pradesh Shivraj Singh Chouhan. Aim:- The benefits being given to natives and bring them at standard life. To provide benefits to salary class individuals through welfare programs and schemes. Under this plan CM Shivraj Singh Chouhan flagged off Uday Abhijan Rath and 51 e rickshaws. Aim:- For announcing altered or flawed meters for all class of customers having authorized load up to 5KW and for little local and non-residential shoppers having endorsed stack up to 2 KW in rural zones. To replace old meters with another electronic meter inside three days. No checking amid the time of operation of the plan for customers having load up to 5KW. Launched on seventh August, 2016 by Odisha Government. Aim:- All weavers inside age of 60 years would get a month to month annuity of 500 rupees for every month. Weavers above age of 80 years would get 700 rupees for each month. Weavers inside age of 60 years would get a month to month annuity of 500 rupees. Launched by 2016 by Prime Minister Mr. Narendra Modi. Aim:- To supress the awful impact of products on environmental condition. Small and Medium Enterprises organizations which takes after the rules set by ZED and meet the norms set by the ZED will be granted ZED confirmation alongside different advantages. More encouragement on delivering things that have "Zero Deficits" in order to accomplish the quality. To support a manageable situation and improvement. To boost and perceive such open social insurance offices that show model execution in clinging to standard conventions of cleanliness and disease control. Various parameters on which the execution of Health Facilities Center would be judged are as Hospital or Facility Upkeep, Sanitation and cleanliness, Waste Management, Infection control, Support Services, Hygiene Promotion. Launched on September 8th 2016 by CBDT. Aim:- To lessen the cases of tax avoidance's and to give help through electronic media. Works will be done under paperless condition under the eyes of an evaluation officer of IT office. Everybody will have the facility to track their complaint and get an answer for their complaint. A different and devoted window for grievance readdress in the Income Tax Business Application. Aim:- To give safe drinking water to everybody in the State through devoted water pipeline diverts in the state. The state government has outlined a water matrix venture to give a feasible and solid answer for the issue of safe drinking water. Mission "Bhagiratha" will give 100 liters and 150 liters of clean drinking water per individual in rural and urban regions separately. Launched by thirteenth January 2016 by Government of India. Aim:- To give protection scope and budgetary help to the agriculturists in case of disappointment of loss of notified crops due to natural hazards, pests or diseases.. 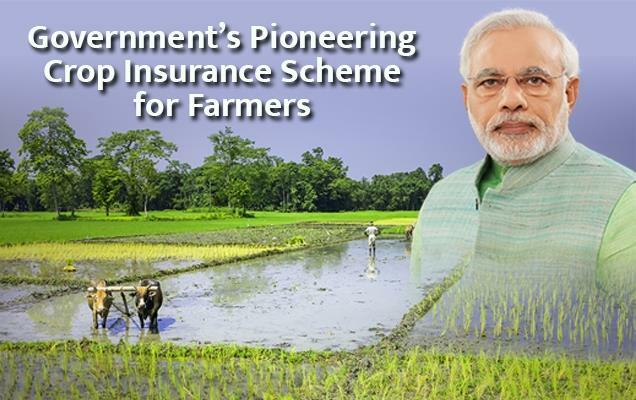 It replaced the National Agriculture Insurance Scheme (NAIS) and changed NAIS. Covers almost 50 percent of the aggregate total crop area in our country in the following three years. Offers a uniform premium rate of 2 percent for kharif crops and 1.5 percent for Rabi crops.